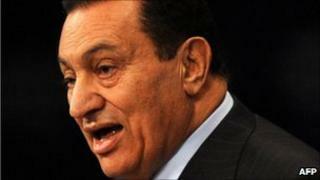 Egypt's public prosecutor has issued a travel ban on ousted President Hosni Mubarak and his family. The order also freezes their money and assets, a spokesman for the prosecutor's office said. Mr Mubarak stepped down on 11 February, after almost 30 years in power, in the wake of mounting public protests. He is believed to be living in his villa in Sharm el-Sheikh but in poor health, and has not been seen or heard of publicly since stepping down. Mr Mubarak handed power to the military, which appointed an interim government to write a new constitution and hold elections. The prosecutor's office said the travel ban and asset freeze was issued while complaints - which were not specified - against the Mubarak family were being investigated, Reuters news agency reported. The order applies to Mr Mubarak, his wife Suzanne, their two sons Ala and Gamal and their wives. Egypt has already requested a number of governments to freeze the overseas assets of the Mubarak family. Protesters and anti-corruption campaigners have been pressing for an investigation into the Mubarak family's assets, put at anywhere from $1bn to $70bn (£616m-£43bn). However, Mr Mubarak's legal representative has denied reports that the former president amassed a fortune while in office. Three of Mr Mubarak's former officials have been charged with corruption-related offences: former ministers of interior Habib al-Adly, tourism Zuhair Garana, and housing Ahmed al-Maghrabi. Justice officials said on Sunday that Mr Adly would face trial on money laundering charges from 5 March.